The third edition of the Ray Kennedy Cup is about to kick off in Denmark – are you up for the challenge? 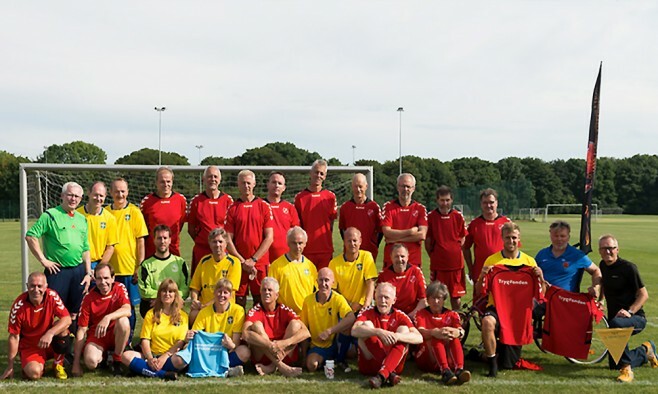 The organisers of the Ray Kennedy Cup – an international football tournament for people living with Parkinson’s – are inviting players from across Europe to enter the competition. The event, run by the Danish Parkinson’s Association (Parkinsonforeningen), takes place in Copenhagen on 19 September 2015. This year, the organisers expect teams from Denmark, Norway, and Sweden –and, they hope, other European countries – will travel to Copenhagen to take part in the 7-a-side tournament. The Ray Kennedy Cup – the closest thing the international Parkinson’s community has to a football world cup – is the brainchild of physiotherapist Finn Egeberg Nielsen, who realised from his work with Parkinson’s patients that the movements required in football were very similar to the ones that he asked his patients to perform. The tournament is named after English professional footballer Ray Kennedy who was diagnosed with young-onset Parkinson’s at the end of his playing career. It is widely acknowledged that keeping active is extremely helpful in combating the progression of Parkinson’s. The organisers believe the Ray Kennedy cup has benefits beyond this by creating a sociable, fun environment for people with Parkinson’s to interact with one another. Raymond Kennedy (born 28 July 1951) is a former English footballer, who has played for Arsenal and Liverpool in the 1970s. The third May 1971 Ray won The League with Arsenal, who thus were Champions for the first time since 1952-53. A few days later the team won the FA Cup. Ray was top scorer in 1971-72 and again in 1973-74, and moved to Liverpool in 1974. He has also played 17 games for England. He retired in 1984 at the age of 32 years due to Parkinson’s disease.